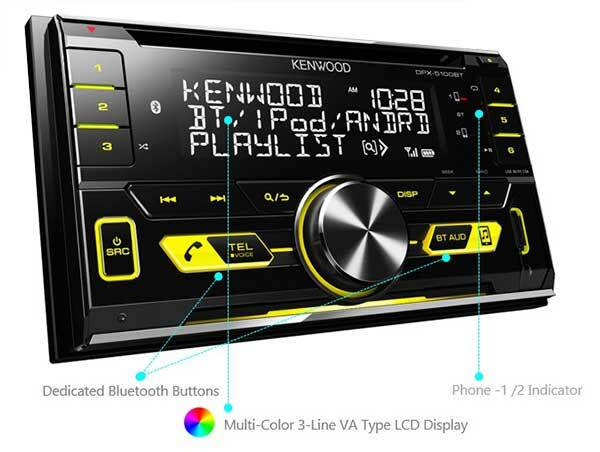 As always, audio performance is top notch as we've come to expect from the Kenwood brand, but when you throw in new features like five phone full time AD2P Bluetooth connectivity for music streaming (2 phone full time connection for hands-free calls), full Spotify control, compatibility with the Kenwood Remote App and built-in steering wheel control interface... Well you get the picture, it's a bad-a@# head unit! Automatically switch the paired 2 phones for incoming calls. Also include the Wideband Speech Hands-free Profile 1.6 for high-quality calling. You can change audio sources or adjust audio settings like "13-Band EQ" or "Digital Time Alignment" from your iPhone or Android. Available for both iOS and Android. Max 1.5A quick charge for selected Android 1.0A charge for iPhone. Really good entry/mid-level unit. Get the Aerpro APP8KE5 harness to make install a breeze. The included Steering Wheel Control cable and inbuilt SWC learning function saves you around $100 by not needing a seperate control unit and works great. Can get a bit confused with Bluetooth connections when you have more than one in the vehicle but it’s easy to sort.